Crystalline perovskite cells are the key to cutting-edge thin-film solar cells. Although they already achieve very high levels of efficiency in the laboratory, commercial applications are hampered by the fact that the material is too unstable. Furthermore, there is no reliable industrial production process for perovskites. In a new study published in the Journal of Physical Chemistry Letters, physicists at Martin Luther University Halle-Wittenberg (MLU) present an approach that could solve this problem. 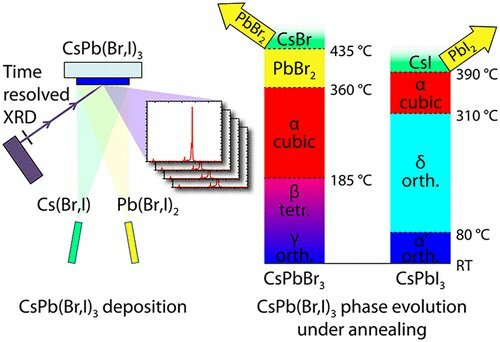 They also describe in detail how perovskites form and decay. The results could help produce high-performance solar cells in the future. In 2009, researchers were first able to prove that organic-inorganic compounds with a special perovskite crystal structure are good absorbers that can effectively convert sunlight into electricity. Within just a few years, the efficiency of perovskite solar cells was increased to well over 20 percent in the laboratory.